LAKEWOOD, Ohio (CNS) — St. Elizabeth of Hungary stands tall, the bread in her right hand, a gift to the poor, looks like it may have just come from the oven. The roses at her waist, visible from an opening in her cloak, are a symbol of God’s protection. The saint as depicted by a 19th-century sculptor has plenty of other companions. There is St. Christopher carrying the child Jesus, St. Stanislaus, the martyred bishop of Poland, and St. Sebastian with arrows piercing his body, seemingly just recently. 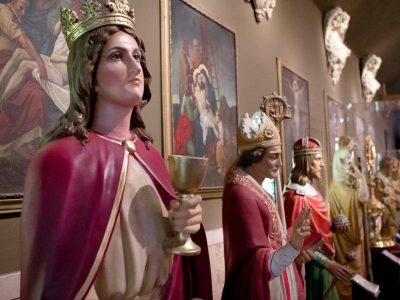 The statues are among dozens that have been carefully restored by Lou McClung, a professional artist, who has made it his vocation — and avocation — to preserve artifacts from closed churches in Northeast Ohio and elsewhere. He displays them in what is now a 7-year-old venture called the Museum of Divine Statues. The museum is housed in the former St. Hedwig Church, which served Poles in this west side, inner-ring suburb of Cleveland. McClung opened the museum six years ago with a small number of statues and artifacts. It has burgeoned to a thoughtfully designed exhibition space with more than 200 artifacts that include reliquaries, crucifixes, a monstrance from Germany and stained-glass windows. 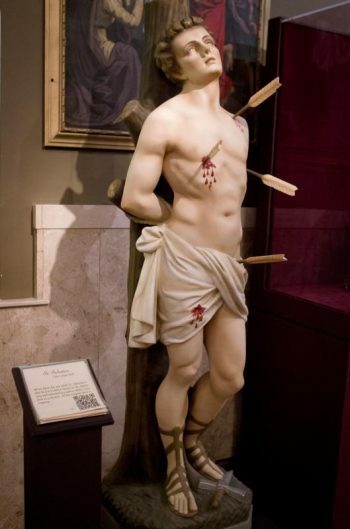 McClung told Catholic News Service he is driven by the desire to keep some of the artifacts from closed parishes from being forgotten or sold to far-off churches. Along the way he hopes visitors can enjoy and learn from them. And perhaps even be inspired. McClung recalls seeing visitors from some of the diocese’s closed parishes who have rediscovered a statue of a saint they prayed before in years past. Others have stood silently as if in deep reflection on the life of a beloved saint. McClung, 45, dipped his hands into restoration work with the idea of collecting it for himself as he built a cosmetic manufacturing business, Lusso Cosmetics, over 20 years. When the diocese announced in 2009 a reconfiguration that resulted in dozens of churches being closed, McClung wondered what would happen with the beautiful statues that had inspired Irish, Polish, Slovenian and other Catholic immigrant communities for decades. He soon developed a proposal for a museum and presented it to the diocese with encouragement from friends working at the chancery. He painted the fronts of some of the statues he had already obtained by putting thousands of dollars on his on credit cards. He wanted to show church officials that he was serious. Retired Bishop Richard G. Lennon listened with interest, McClung recalled. “Yeah, he knew I wasn’t a flake. That was the biggest thing. He knew I wasn’t nuts,” he said. McClung had high hopes for the museum. He placed a bid for the St. Hedwig property, which includes the church, a school and a rectory. As time passed, his real estate agent was unsure the diocese would accept the bid. One day, McClung was on the phone with the agent, who told him to begin looking for another property. “At that very moment, he (the agent) said, ‘Can you hold a second?’ and clicked over on his phone. It was actually the bishop telling him if I could come up with $10,000 more, I could have the property,” McClung recalled. McClung agreed and for $150,000 the three-fourths-acre property was his. He called the moment both scary and joyous as he realized he was about to realize a dream. Six months later, in April 2011, the museum opened. As the effort grew, an anonymous donor provided funds for about half of the artifacts in the museum. Running the nonprofit museum takes time and money, McClung admitted. Between his business and the museum, he usually works 85 hours a week. With no professional staff, McClung is curator, director, fundraiser and chief communicator for the museum. He depends on his mother, stepfather and a few friends — all volunteers — to carry out much of the museum’s operation. McClung must constantly raise money and seek sponsorships for new items to display. He is in the midst of a museum expansion, with plans to develop a 2,000-square-foot Hall of Saints in the adjacent school building, where his cosmetics firm also is housed. While he is almost exclusively building the space himself, he has had to stop construction until more funding can be secured. Once the new space is completed, the statues of the saints will move there. The current 3,000-square-foot exhibit area in the former church building will be used for rotating special exhibits. McClung said he envisions turning the museum into a fully professional operation with a staff of experts. Current exhibits already are interactive. Visitors receive a tablet they can use to scan QR codes to learn about the artifacts and the history behind them. Video screens guide visitors through the history of Cleveland parishes and other historical events. In addition, McClung is looking to develop multimedia stories about the ministry of women religious as well as the ethnic communities to which the closed churches were once home. It’s the stories of faithful people serving the church and each other that will draw visitors and keep people engaged, he said. He also wants to add art from the 15th and 16th centuries, the time period from which 19th- and 20th-century sculptors of the statues on display often drew inspiration for their work. The idea is to show the connection between the art and the statues that people so revered. For now though, McClung and volunteers will continue to operate the museum. It may not be a divine calling, but McClung thinks it’s not a coincidence that he’s overseeing a place where people find inspiration. “I don’t know how to say it. I think this is what I’m supposed to do. It feels kind of like a service. People have different focuses and ways they live their life. So this is one of the things I’m supposed to do,” he told CNS. What a beautiful, loving witness Mr. McClung is. One day maybe our beautiful paper mache statue from Bellona, Italy Maria SS di Gerusalemme will be in this beautiful building along with all the other saved statues are.